The snuggliest way to carry a newborn in winter is in a sling. The baby gets all your body heat which is brilliant for helping them regulate their temperature and they are more likely to stay calm knowing their mama is right there rather than wasting energy calling for you. Our Papoozle is ideal for a new baby and offers three layers of fabric between baby and the outside world too helping to keep them even more snug. Babywearing is best if the baby can feel your body heat so try to limit the layers between baby and you. Instead, try a babywearing jacket that comes around you and your newborn keeping you cuddled in together and makes it easier to go outdoors and back in again without over heating. We love this super cosy one from Mamaway. 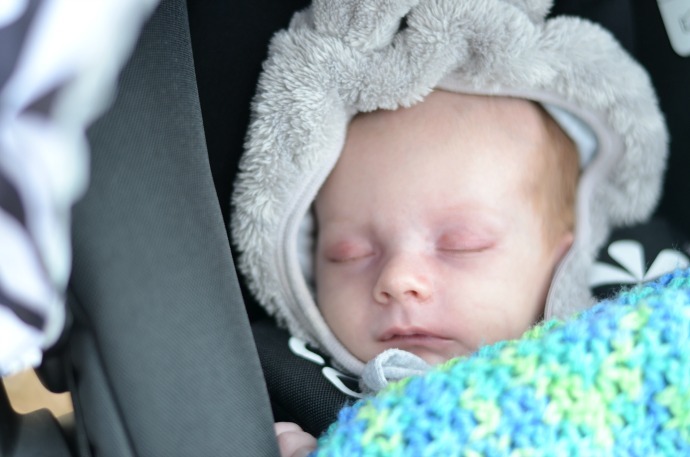 Snowsuits are absolutely adorable but not always practical, especially in a sling or car seat so having a good ‘snuggle suit’ can be really useful. We love these ones from Frugi. The nights can get pretty chilly and so having a cosy sleeping bag is a great way to keep a new baby at the right temperature. The Babasac is perfect to last your baby through their first six months as it can work as both a winter or summer tog due to the removable layers. Perfect for laying on, cuddling up with and keeping warm in the winter, blankets are a newborn essential and there are so many around the choice can be pretty overwhelming! We are loving the beautiful designs from Little Green Radicals, especially considering they are all organic! Newborns in snowsuits are just adorable and perfect for chilly days in the pram. These ones from the Essential One can turn your newborn into a teeny teddy and what is cuter than that? What is your ultimate winter newborn essential?